Click here to reserve your free ticket on Eventbrite. An entire minke whale was CT scanned using a rocket motor scanner to investigate the sound reception apparatus. The multiplicity of pathways for sound within the heads of whales have intriguing similarities to radio antennas. Both can function in either transmit or receive mode. Both can preferentially send or receive signals with specific frequencies or directional characteristics. Cetacean heads also function like vibroacoustic antennas because sound enters through multiple pathways, which are eventually integrated by the anatomic geometry of various tissue structures. These processes eventually bring acoustic signals to the whale ears by various means and mechanisms. Those pathways can modify sound quality by filtering, refractive collimation, constructive interference, or attenuation. 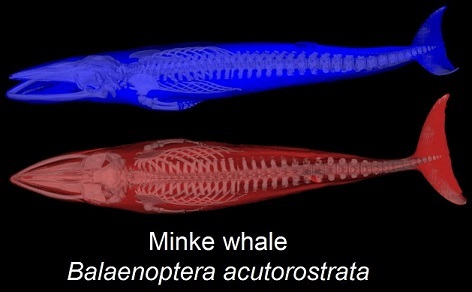 Finite element modeling results suggest that cetaceans have an intricate structural complex that forms a kind of acoustic "pinna", between the skin and ears. This complex processes various acoustic inputs according to frequency, amplitude, location, and incident trajectory. Various input pathways can coalesce or interfere with one another constructively or destructively, according to a complex set of physical rules. The interactions between pathways apparently vary with species specific anatomic geometry. Ted Cranford began his training in marine mammal science as a volunteer at the Cabrillo Marine Museum in 1975. He is currently Adjunct Professor of Research in the Biology Department at San Diego State University. He received a B.S. in Biology, an M.S. in Marine Science, and a Ph.D. in Biology from UC Santa Cruz. Dr. Cranford has received awards for innovative research and excellence in scientific communication. Ted has teamed up with Professor Petr Krysl from the University of California, San Diego. Their research incorporates remote imaging technology in combination with traditional anatomic tools and finite element modeling software. Their innovative methods have demonstrated significant discoveries and investigative approaches that reveal the structure-function complex in marine mammal bioacoustics. This lecture is sponsored by Chicken of the Sea! Click here for teacher resources related to this lecture.